I made these cards late in the day/evening on Sunday and was unable to figure out how to light the photos decently before my camera battery died (and I'm not saying I would have figured it out if the battery hadn't died. Photography is still a mystery to me!). I decided to save my sanity and just wait until morning, when hopefully, the light would be better (and it's not much better, due to the remnants of hurricane Sandy- we're supposed to be having a stormy, rainy day/week here in Toronto). My cards are based on this card by this week's Featured Stamper, Janine (aka 'nines'). I thought the idea of using three images with the sentiment placed between two of them was quite interesting. 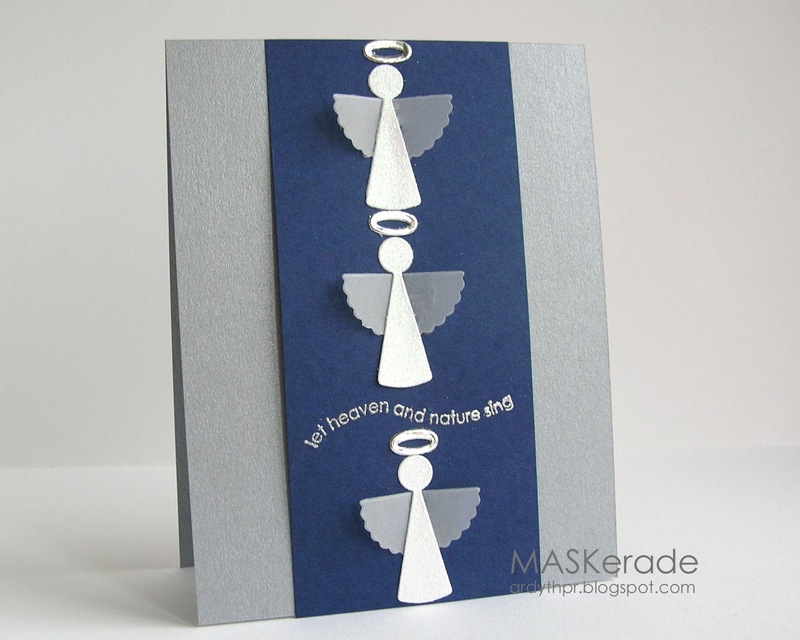 The angel is a Lifestyles Crafts die, with an Impress Rubber Stamps sentiment. The bodies are cut in white glitter paper, the wings in vellum and the halos are silver mirror card. I've lost track of who made the horse stamps and the sentiment is Inkadinkado. I've not been a fan of angels, until I saw yours. Both cards are wonderful. Funny you should think your photo skills lacking.....I've always thought them exceptionally good. I like that you get close-ups without blurring and your colors always look like what you say they are. One of your perceived 'bad' photos would kick one my 'good' photos on any given day. The photos are always sharp and the colors vibrant. These cards are fabulous - love the sweete Angels! The focus seems to shift to the sentiment when it is placed between the images.